This fall/holiday season, I am happy to once again be in multiple gallery shows! 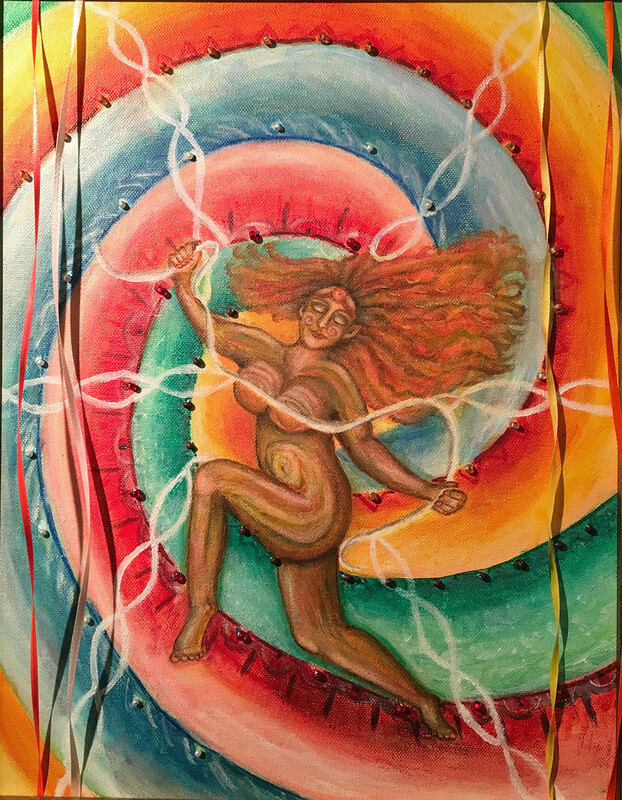 For the month of October, two of my recent pieces are on display: Sacred Connection and Ecstatic Joy. 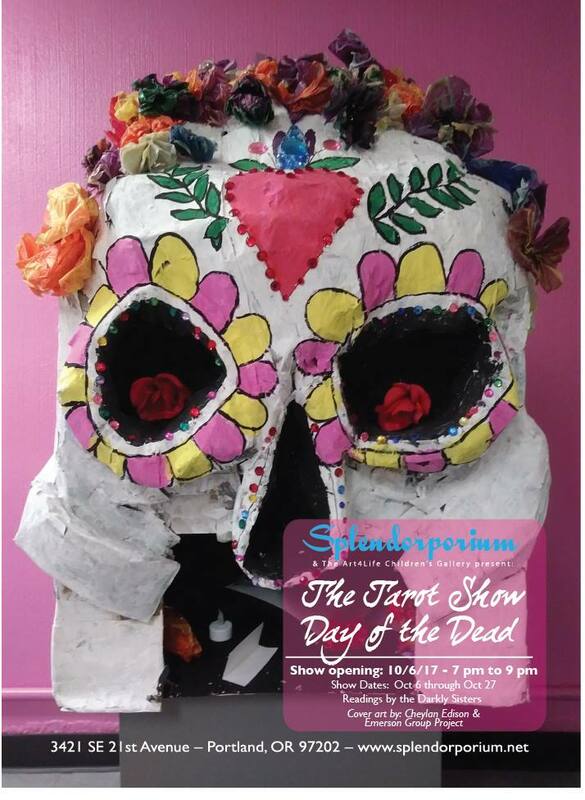 Sacred Connection pays homage to the tradition of Dia de Los Muertos. 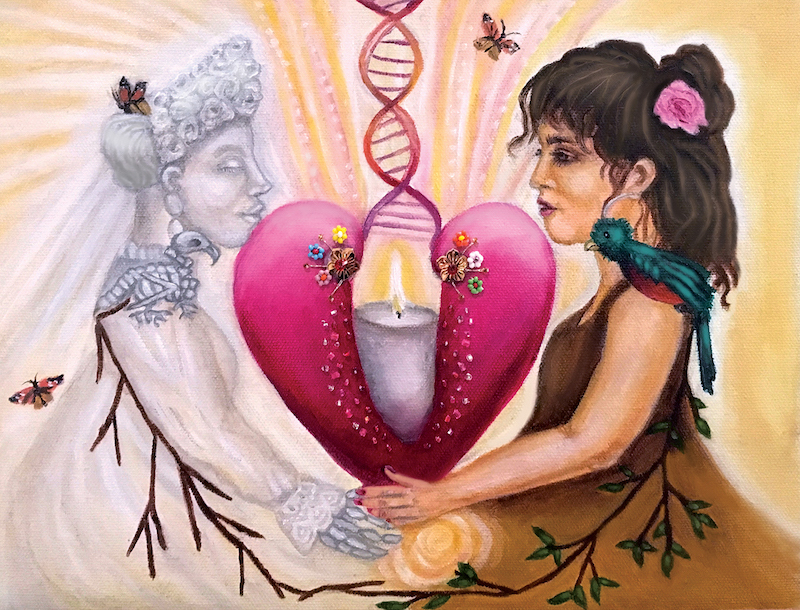 And beyond this, it speaks of spiritual love, human connection and the cycle of life. After our trip to the Yucatan last year, I returned with an even greater sense of connection to the earth and to those who have come before. Visiting ruins sites, I was awestruck by the loving embrace of the land. I felt the vitality of the old civilization, though it had been ‘gone’ for centuries. I felt as if I could imagine watching them there going about their daily life or what it must have been like walking through the doorway seeing the sky. How spiritual it felt to be surrounded by meaningful decorations and objects, perhaps cherishing each meal or event that occurred. A Quetzal sits on her shoulder, a majestic bird sacred to the Mayans and Aztecs representing goodness and light. Our ancestors teach us lessons and give us guidance- their spirit surrounds us with a great love. It is present in everything and has been a part of humanity since the beginning. I feel it is fitting that in this show this piece also represents The High Priestess card. I painted Ecstatic Joy! as a pure expression of celebration and jubilation. This piece celebrates our greatest potential for happiness, success, and feeling one with the universe. It is also a visual representation of how the arts- i.e. ecstatic dance, music, visionary art, spiritual poetry can uplift us. The figure is pregnant with life, and I chose to merge the foreground with the background to convey a strong sense of vitality and oneness. In the show, this piece aptly represents The World card. I first created this painting late last year for the Siren Nation ‘Celebration’ show as well, a wonderful local organization that supports women in the arts. And I’m excited to be part of Siren’s upcoming ‘Reflections’ show in November. Stay tuned for more on that!